Philippines Real Estate – Is it Too Late? | LIVING IN THE PACIFIC - Philippines to Guam... One Day at a Time! Philippines Real Estate – Is it Too Late? – LIVING IN THE PACIFIC – Philippines to Guam… One Day at a Time! Philippines Real Estate – Is it Too Late? It was in October, 2006, and I was on my way to our annual real estate franchise convention in Las Vegas via a planned itinerary stop in Denver for a short layover and plane swap. While browsing around in the airport bookstore, I came across a paperback book titled “Sell Now! : The End of the Housing Bubble“, written by John R. Talbot (St. Martin’s Press-2006), a bestselling author and former investment banker for Goldman Sachs. Being a real estate broker, I was immediately drawn to the title and with about 2 hours to kill, I purchased the book. I was so intrigued with the presentation of content that this one individual could put forth, seemingly under the radar of an entire industry, that I read nearly half of the 208 page prognostication before arriving in Vegas. I later finished the book after returning home to Mississippi at the conclusion of the 4 day convention. After re-reading certain portions of the book (for better self-understanding), I presented my new-found thoughts on the topic of a possible housing crash at our next office sales meeting. At the time, I had 6 sales agents that listed and sold residential real estate under my franchised tutelage, and I believed that my agents should always glean new and “insightful” information as it would be a good complement to their overall skill set – It’s like adding another arrow to the quiver of real estate ‘in-the-know’. I was sure that having agents armed with this important information going forward, could only be a benefit to the franchise as a whole in the area of client presentation, and more importantly, representation. At the conclusion of the meeting, I placed the book in a location that was available to anyone who wished to read it. No one did! Not only did it go untouched, it was quickly forgotten and (conveniently) shrugged off – it was treated as something that was either totally uninteresting or, maybe more accurately, as absolutely unimaginable (I knew this because of the accumulated dust on the cover!) In this – Talbot’s latest release – he raised the stakes from his previous best seller, “The Coming Crash in the Housing Market”, and further warned of the coming housing crash, bluntly advising real estate owners to liquidate in a hurry. He painted nearly a mirror image correlating the state of the U.S. housing market with that of the Japanese real estate crash of the ’80s. The conclusion of his latest effort was nothing short of doom and gloom and in most everyone’s right mind, there was no conceivable way something like this could ever happen. In Japan, okay…. in America, no way. Because nobody in my office took any interest in this information, I began to quietly question myself as to whether “I” was being realistic or paranoid, or whether everyone else was just in denial of the facts as they were laid out. Looking back in retrospect, and comparing the warnings of then with the similarities of the recent public re-installment of President Obama (IMO) [at the time of this writing], I believe the reasons for the neglect of the book were more aligned with plain and simple denial. How was I to convince my real estate sales agents to go forward and demolish many a homeowner’s proud and faithful argument that real estate is the best investment and that it will always increase in price. Most people will readily deny something that causes uninvited pain or mental anguish in their lives. It is philosophically easy to deny that which is unknown rather that accept new conclusions that depart from patterns of thought that have become familiar. It was at this point in my career that I began to have doubts…about going forward…about working. I already knew that I wanted to retire from working (sooner than later) and locate somewhere back to the Pacific theater where we could relax in the warmth of the tropics 24/7/365. Several years earlier I began thinking about going back to Guam to live (Fascination with Paradise). Moving to Guam meant I would have to work longer (well past my targeted retirement age of 55) before moving or, I could just move and secure a job there and work even longer. Or, we could settle in the Philippines on a much earlier timetable, supposing the now ever-looming real estate crash did not cripple our plans. I was already looking at passing planned target age. My wife, several years earlier, utilizing the modern wonder of the upgraded bamboo telegraph (4.0), initiated and launched a search party back in her home province with the goal of finding an affordable plot of land to build on. One that we could securely build a second home on over time and enjoy for the rest of eternity. As fate (‘design’ is probably a more accurate word) would have it, her sister discovered that the corner lot just down the street from where she lived was for sale. Now this was both good and potentially bad. Good in the sense that the last 3 homes we’ve owned were all corner lot homes (I even grew up on a corner lots) and we’ve always enjoyed the benefits and advantages of living on a corner. The downside was living on a corner lot in the Philippines and being ever so visible and exposed to the community at large. I surmised that since I was already going to stick out like a sore thumb, I might as well bite the bullet and be a rock star – center stage. Oh well, it was nonetheless a corner lot close to her sister and it was less than 50 meters (or long-arm passing distance by weak NFL quarterbacks) to the ocean. It was game on. So the lot was acquired and the wife launched our committed effort to help sustain the viability of family and the local economy – the construction process was underway. So in 2007, the construction of our retirement bahay (house) began. Managed by my wife’s trusted sister and brother-in-law, they picked the builder, workers, purchase the materials, overseen all the construction and maintenance (provide updates and photos), manage the costs, and the day-to-day security of the property. 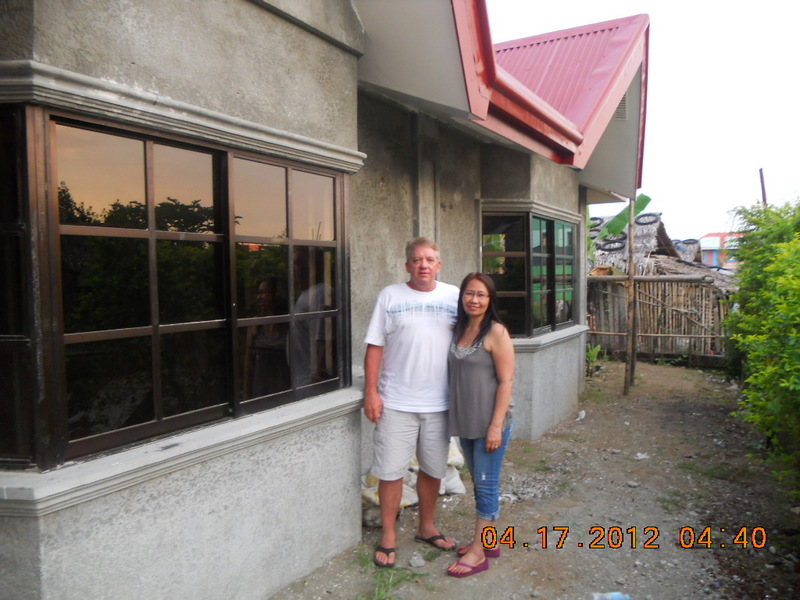 One of the advantages to building in the Philippines is that you can take your sweet time with your project. Unlike most areas in the U.S. where permits and government rules, regulations and what-not, dictate a timely construction process start to finish, in the Philippines it’s more of a build-as-you-go (as the money allows) scenario. Meaning, if you have money, you can build something (just about anything) and if you run out of money, you just take a break until you have more money! Now in many parts of the western world where most homes are framed with wood, this is not feasible. In most cases, you cannot allow raw lumber to be exposed to the elements without fear of some deterioration, and especially for long periods (termites and wood destroying insects). In the Philippines today, many of the more modern building projects are done with concrete and I mean nearly all concrete. the walls, floors, roofs and ceilings, even cabinet bases…all done in concrete, with finished surfaces of stone, tile or marble, and therefore will last until the next phase of construction, whenever that may be. Our house has a more traditional roof system constructed of wood (treated) and metal, but it was completed early on to protect our investment. The rest of the structure is a pay-as-you-go concrete bunker (so to speak). Our Bahy or, money in the bank! Back to the housing crisis and the U.S. recession. The motivation to begin building a house years before our actual retirement was incited by several factors – the state of the economy, our rate of savings, the rates of return on any savings and investments made here in the U.S., and the future economic outlook. With bank savings rates at all-time insulting lows, and with the fear of losing all one’s money in the markets, it became clearer as time passed that a continued demise of the dollar would work against us with our money planted here. We learned quickly that we didn’t need to tie up any money in fixed or long-term investments with fears of not being liquid enough for our own protection from losses. Knowing very little of currency trading – all we had to know is that the dollar was losing value against most foreign currencies (including the Philippine Peso) and as long as the Fed kept up their quantitative easing practices and printing of money, the dollar will continue to lose value – it made sense to fund our construction much the same way we would fund a savings account. Instead of depositing money into savings every month, it was sent abroad and invested in the house. As it turns out, we came out much farther ahead. Since 2007, I figure we have averaged a net gain of nearly 12% on our investment (just in monetary value) against a real loss of nearly 20% in purchasing power if we waited to convert dollars to pesos at today’s exchange rates. Now take the appreciative cost of construction materials over the last 6 years and it’s not hard to see that we beat the markets here (in the U.S.) by a good margin. You may be thinking – Well that’s all good for you and that ship has sailed and I’m not on it – but you would in all likelihood be wrong. I’m no financial smarty pants or anything as it just worked out for us but, you don’t have to be a financial genius to understand that America’s future and the odds that the dollar remaining as the world’s currency is in real jeopardy. As of this date, it is projected that America’s debt at the end of President Obama’s 2nd term will be at $20 Trillion. I think even the Mayans, with all their great astrological and mathematical skills, would have trouble with that number. Going forward, America will have trouble paying down the debt and in finding anyone insane enough to buy U.S. Treasury Securities that help fund the national debt. Some might disagree with me but IMO, the only way out will be higher taxes implemented by increasingly socialist policies. And that is a totally different topic of discussion. You see, just as in the real estate industry as I explained, there are the naysayers and deniers of demise, many whom are living in their American “Dream-state”. They will continue to defy the odds and live in big expensive houses, and drive gas guzzling SUV’s as they increasingly fund their lifestyles with credit cards. Credit card debt in the U.S. is now (at the time of this writing) the third largest source of household indebtedness. Only the $8 Trillion mortgage debt and the $1 Trillion student loan debts are larger (household credit card debt in the U.S. increased by 7.9% [annualized] during 2012). What can you do now? 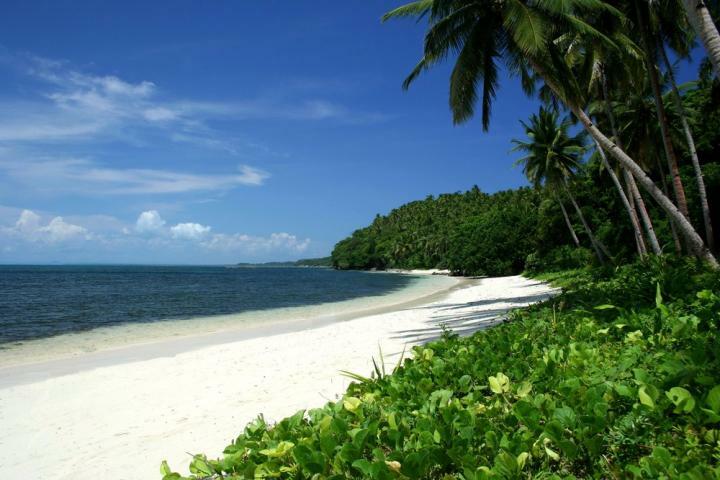 If moving to the Philippines is in your plans, start saving. If you are working, keep working and keep saving. Don’t waste your money on ‘stuff’ – learn now to become a minimalist until the day you depart. Where should you put your money? Again, I am not a financial counselor or planner, but I still feel that a savings account is not a good place for anyone’s money (except for the physical safety it provides) and if it were me and for the long-term, I would be buying precious metals. 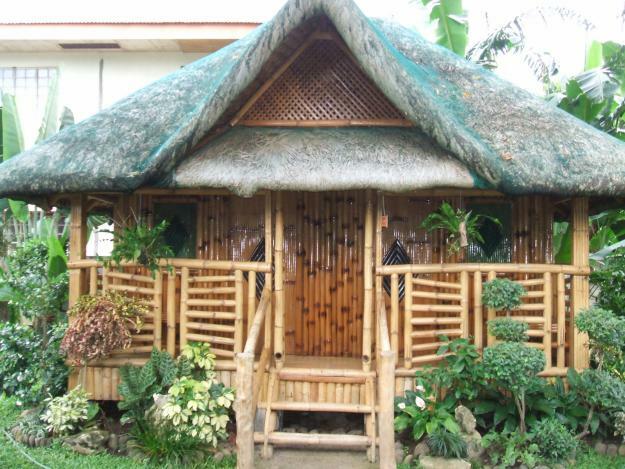 Or, it’s not too late to start building your bahay kubo, one stick of bamboo at a time! This entry was posted in Real Estate Info and tagged bahay, beach house, beaches, build, building a home, calbayog city. visayas. cebu, construction, house, invest, investment, land, leyte, live, lots, philippine construcion, Philippines, resorts, retire, samar. Bookmark the permalink. It’s ironic that you are at the mercy of the housing market now before you can move to the Philippines. Is that center picture a picture of your house here?